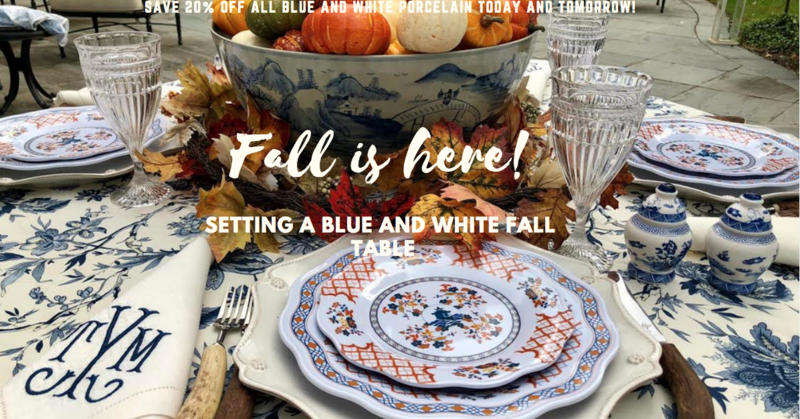 I do a “blue and white club” virtual meeting once every few weeks and this week is all about fall, blue and white and just how beautifully they go together! 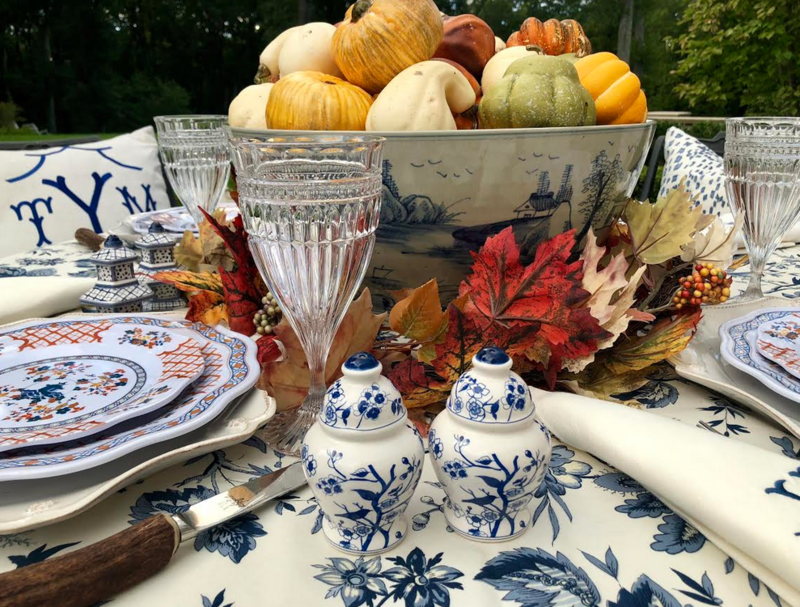 I just love blue and white during any season but must say there really is something to be said about blue and white against fall’s majestic rich colors. 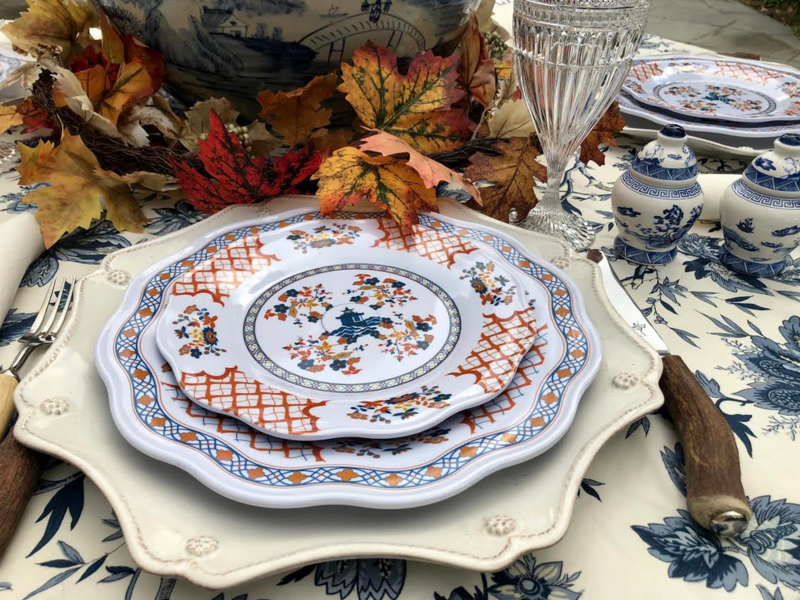 I got my beautiful orange/blue pagoda melamine and paired it with my Juliska ivory chargers, took out the gorgeous antler cutlery and a very pretty but old Ralph Lauren table topper. 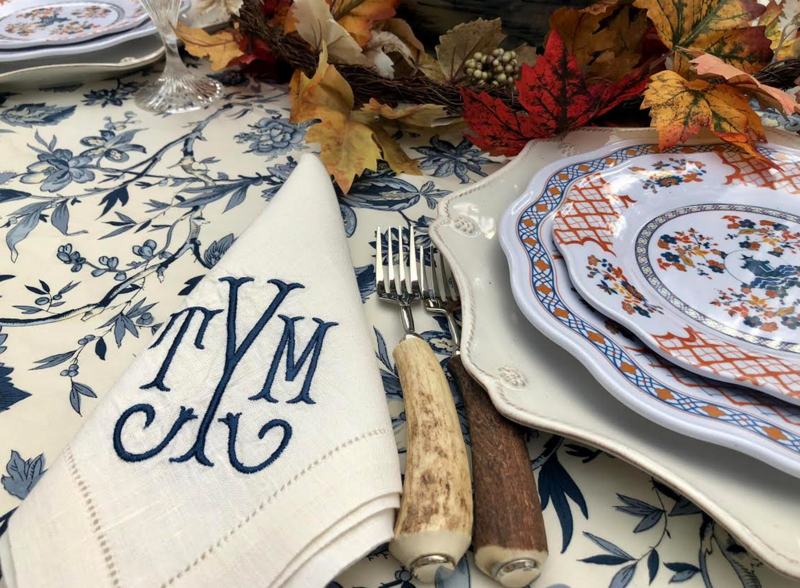 I added some pretty fall leaves, crisp linen monogrammed napkins and goblets. Then, I added my FABULOUS new porcelain salt and peppers….cannot tell you how in love with them I am. I cannot decide which pattern I love more!!! They are truly incredible. They will be here in about 3-4 weeks, can hardly wait! 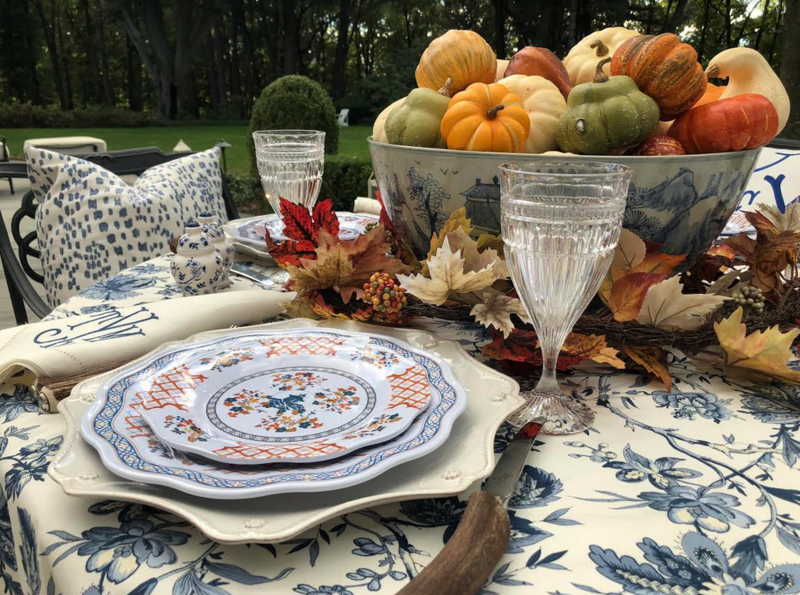 I really do love the how this table came out, it feels festive, warm, inviting and very fall like. 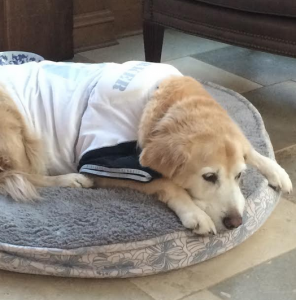 Proof positive that blue and white truly is for every season. 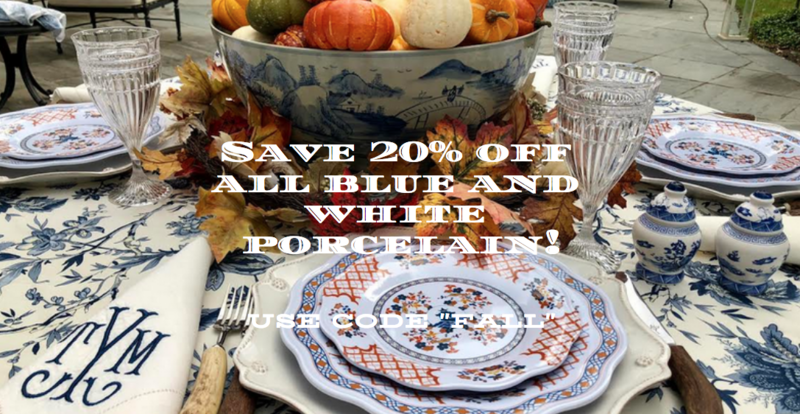 Take a look and in celebration of the blue and white club, we are offering a 20% savings off all porcelain! Can’t get enough of these darling salt and peppers! 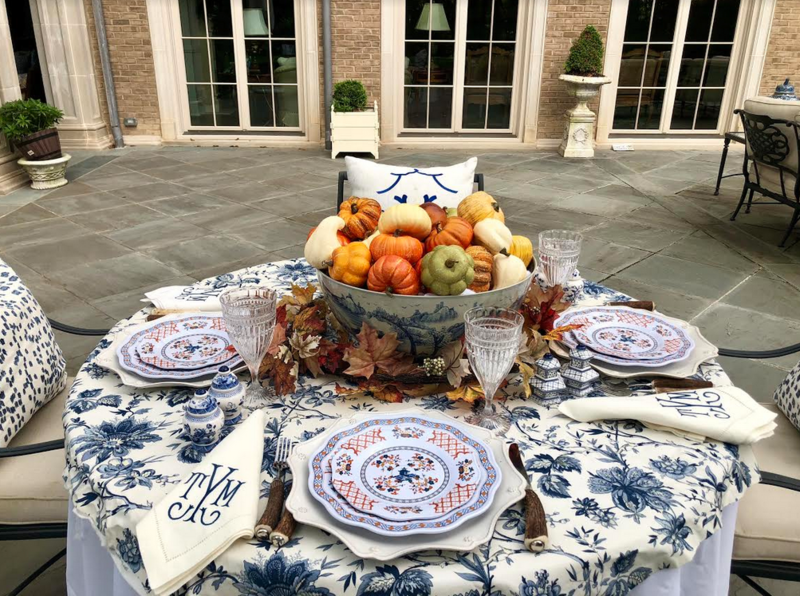 An elegant monogram table is a must for any table I set! Tina the colors are absolutely beautiful together. Great job! 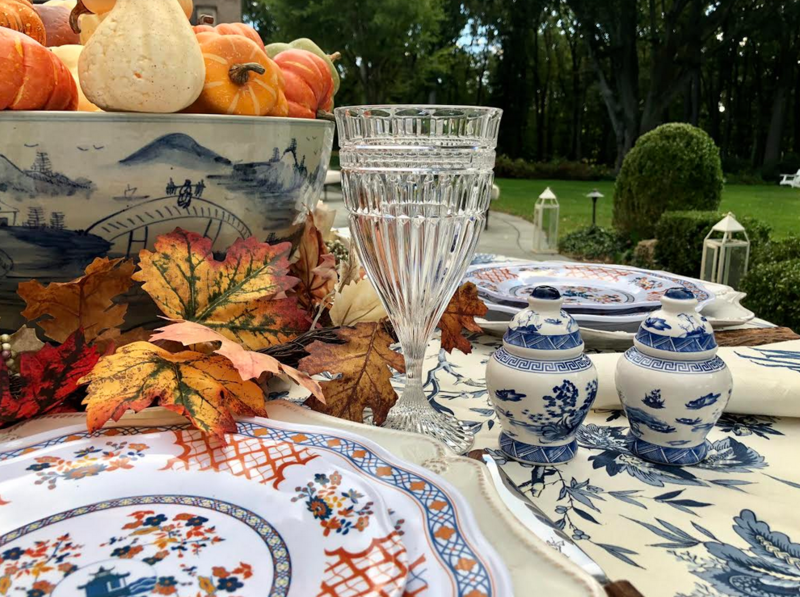 Autumn is a beautiful time of year and You have captured the colours on your table. 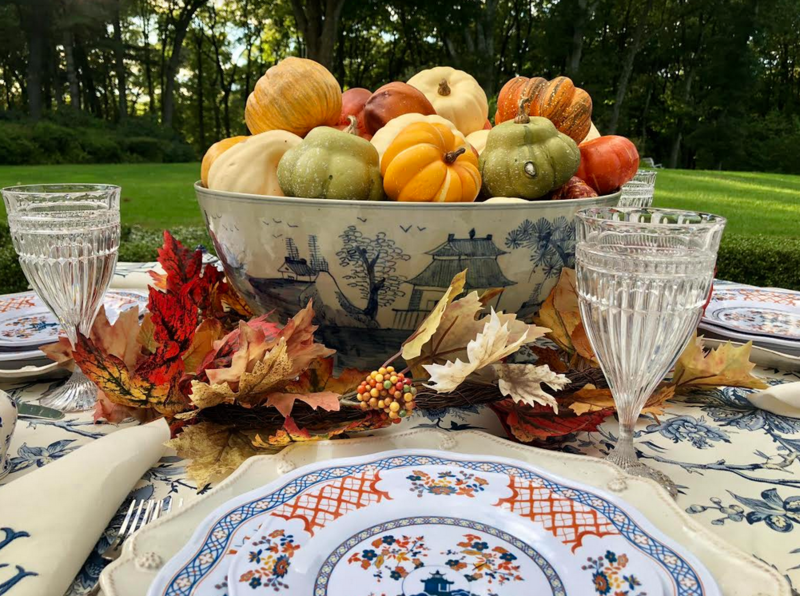 Do you have soup bowls in your melamine dish sets? 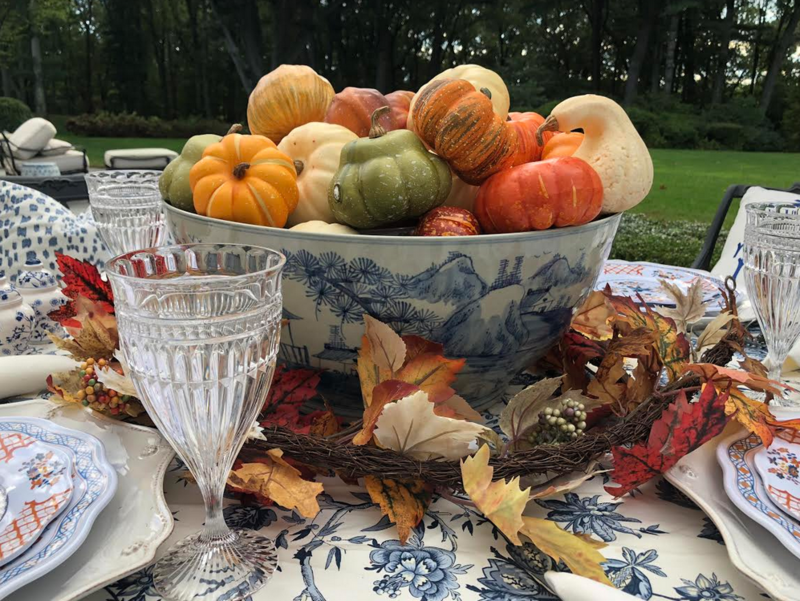 I’d love to add a bowl of squash soup to your table. Yummy! 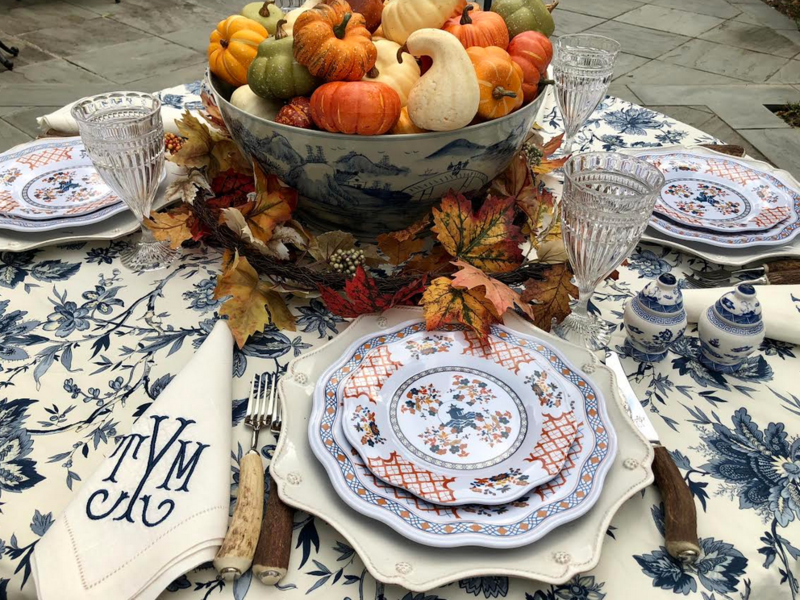 I’m in love with that table cloth. 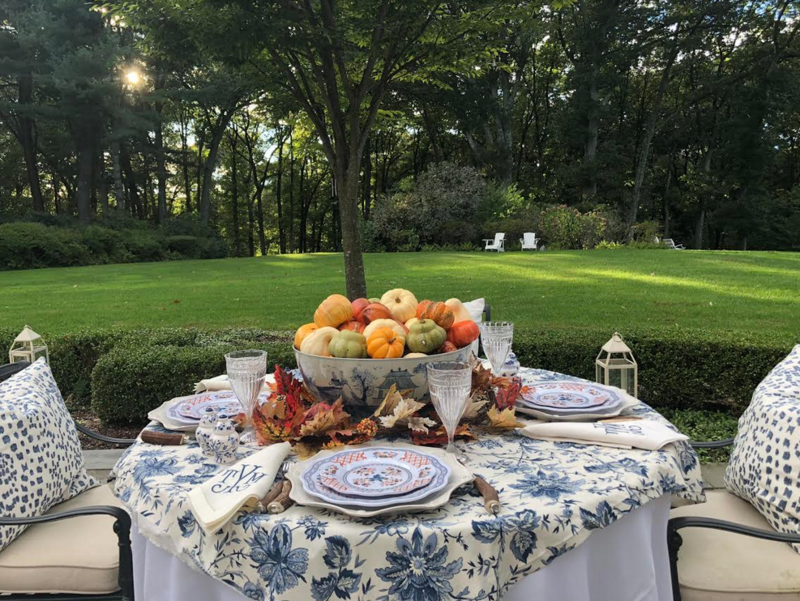 It makes a perfect backdrop for all the table setting has in store for guests. So so beautiful. 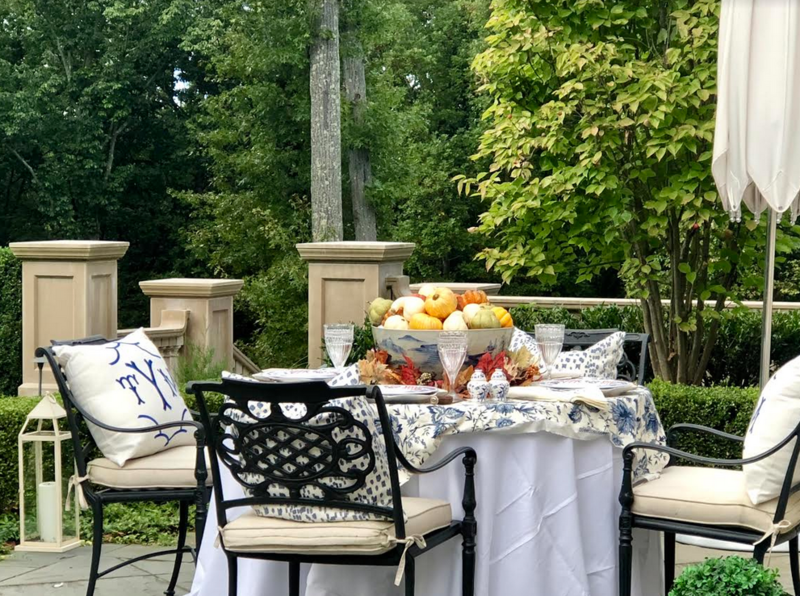 Gives me some great ideas for a family dinner we are hosting to celebrate my father in laws 75th birthday next week. I love every single thing about it! 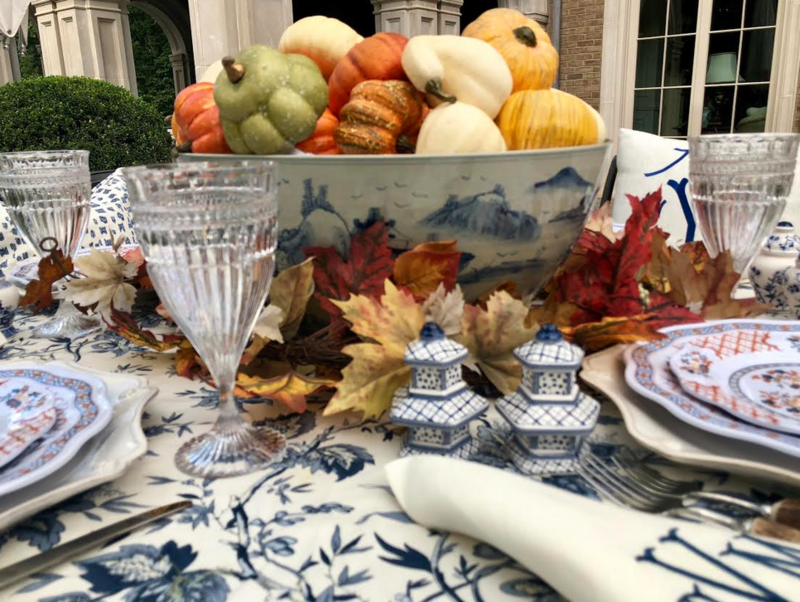 You are truly gifted at table setting plus so much more. Love your blog! I cannot wait till the salt and peppers are for sale, they are the cutest. 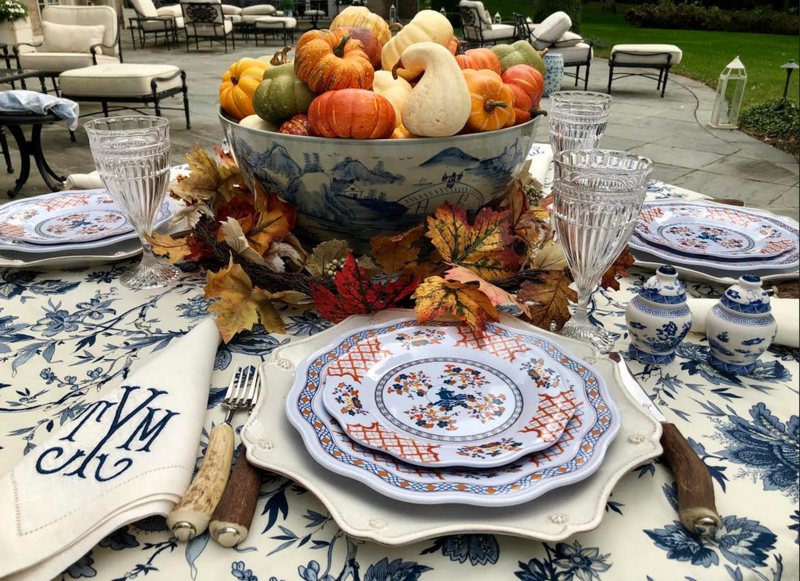 What a breathtaking table!! I love how you took something casual like melamine and took it to the next level. I bought that bowl, and love it. It is so much prettier in person. 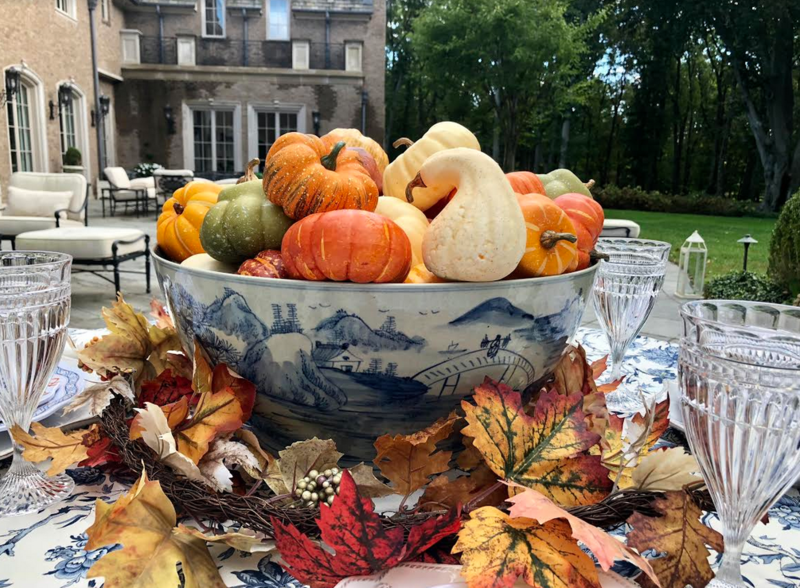 I love the idea of filling it with little pumpkins, need to copy that. Have a nice weekend Tina. Hi Tina I’m interested in the salt and pepper shakers but don’t see them on your web page. Can you please send my information on them. Thank you so much! These pictures are just wonderful! 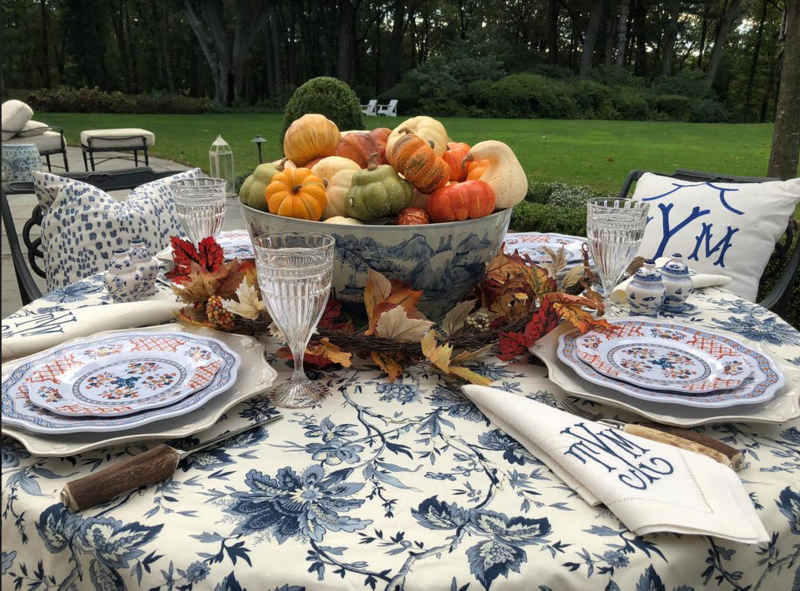 All the fall colors with the blue and white are perfect. And isn’t orange such a fun accent for the blue! 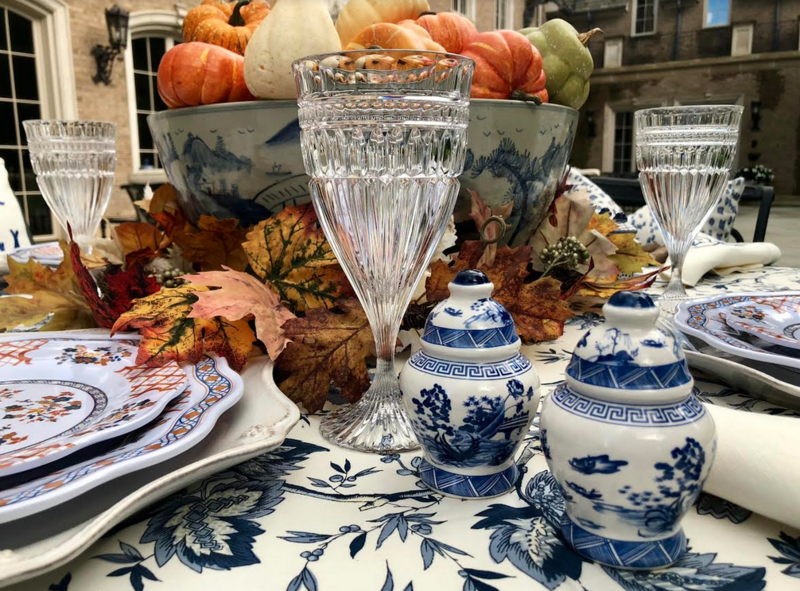 Reminds me of all the beautiful blue and white porcelain and Imari I was blessed to inherit from my beautiful mom who lived in Japan when her father was transferred for work there! I finally appreciate it all!